TalkBack Radio Hire – TalkBack Radio Hire, the no nonsense radio hire company. TalkBack Radio Hire, the “no nonsense ” radio hire company. Based in The North East of England but providing a hire service throughout the UK for over 20 years. 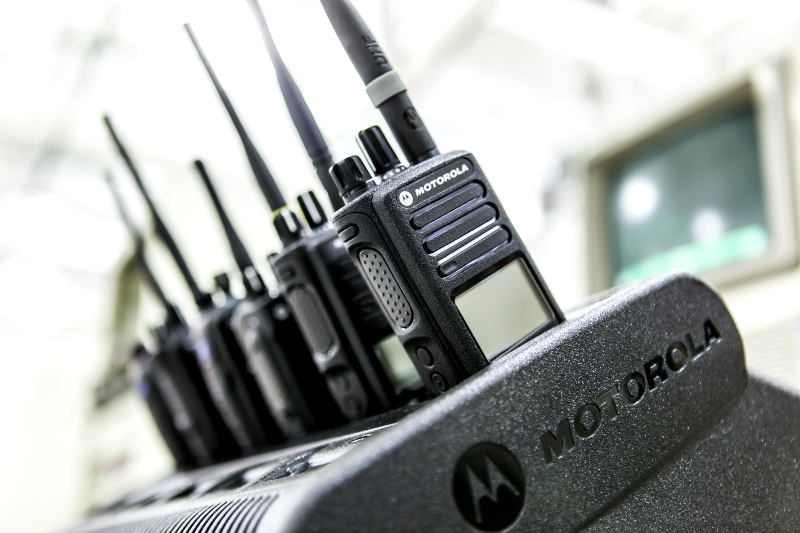 Welcome to TalkBack Radio Hire, a dedicated Motorola radio hire company located in Newcastle upon Tyne. Equipment can be hired by the day, week, year or longer. Prices can start from £3.50 per unit per week. No initial capital outlay – pay only for what you use, when you use it. Additions and replacements are quickly supplied. Multiple frequencies and channels are available. No OFCOM radio license needed (use our hire license). Catering for simple radio systems to extensively backed up multi site systems. 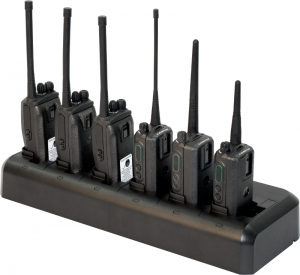 Supplement existing radio fleets for short duration’s. We have handportable and mobile equipment (various models) in analogue and digital formats. We have a variety of charging solutions, carrying solutions and audio accessories available. We also have our bespoke deployable control room solutions that offer radio over IP (ROIP) and voice recording facilities. If you need wider area coverage we can hire out radio repeaters (boosters). 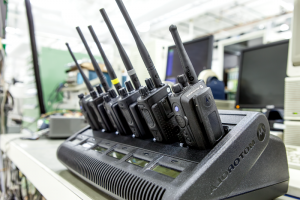 In certain setups using digital technology we can get the radios to “roam” between the booster sites. 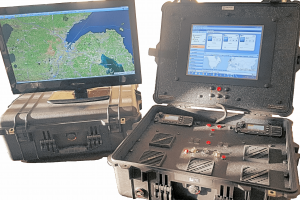 Portable and deployable radio rebroadcast units are also available for certain unique setups, these can provide gateways between different frequency bands or even between analogue and digital platforms. Can I order equipment directly from this website? 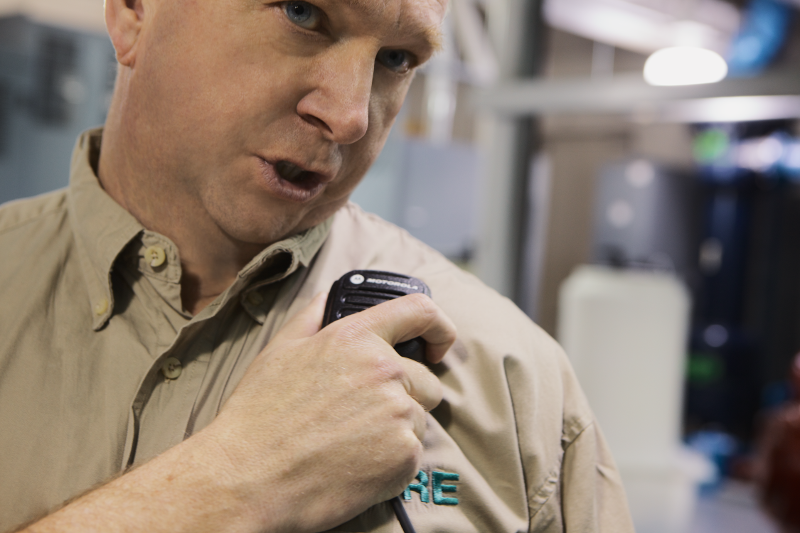 Do I need a license to hire radios? 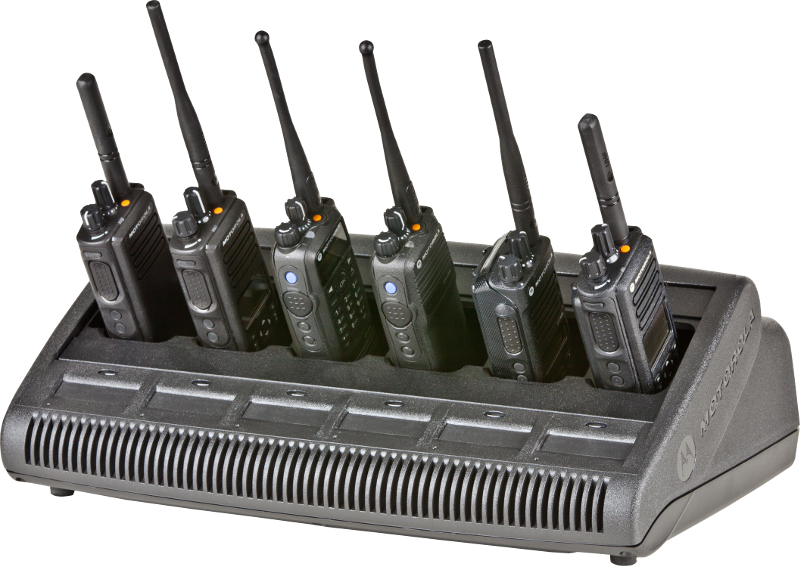 I urgently need to hire radios - how quickly can I have them? I don't have an account, what do I do? Non-account customers would be asked to complete a account application form (a link is in the HIRE section), account status verified prior to the hire commencing. Times depend wholly on how quick you get us the needed information. 30 day account customers may pay by standing order, BACS or cash. Non-account customers may pay by cash or credit card (2% fee applied). Our service vans regularly deliver & collect equipment to and from our customers throughout the North East of England. We use a next-day courier for deliveries and uplifts to our customers throughout the U.K. In the unlikely event of a radio failure, what do I do? 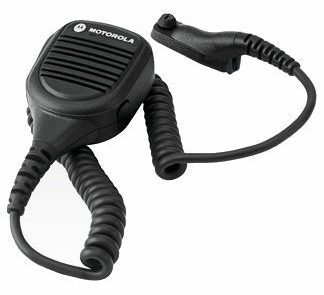 Motorola radio equipment is very reliable. Radio failures are rare but it can happen. A replacement will be sent immediately as soon as we have been informed. Can you service or sell me radios? We have a fully equipped radio service workshop. 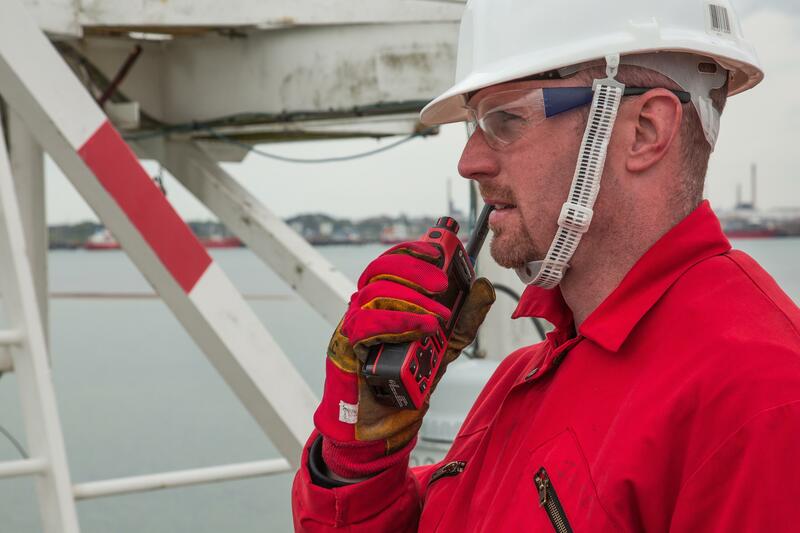 We service, repair and check over most radio platforms. We also sell radios and accessories, contact us for more details. I need something a little different? If you need something that needs to be managed or have larger requirements that needs to be planned, contact us and we can have a chat. Spare Batteries – We always have a large serviceable stock of spare Battery packs. The Lithion Ion units are high capacity, thinner and alot lighter than the their cheaper counter parts. 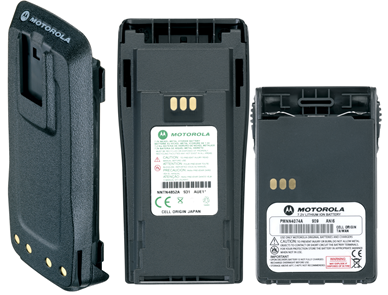 All batteries are original Motorola NOT cheap 3rd party copies. This ensures peace of mind and optimal performance. 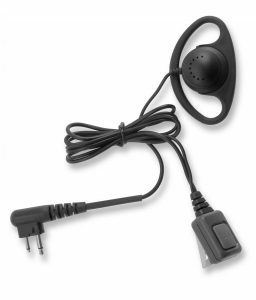 Remote Speaker Microphone – Noise Cancelling Remote Speaker Microphones with a 3.5mm earpiece jack. Makes operating the radio a little more convenient. These items are robust and essential with heavy industry. Item can be used with the 3.5mm earpiece option (also available). “Around the ear” 2 wire earpiece/mic – Hygienic around the ear “D” styled 2 wire audio accessory. Extremely comfortable to wear for long periods with a flexible rubber backband. 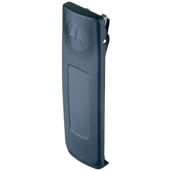 The accessory has a combined PTT and microphone, very light weight. Lightweight Headset – A lightweight headset (single cup) with a flexible boom mic. There is an an inline PTT unit built into this accessory. 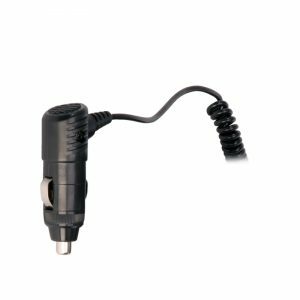 12VDC Charger – This option gives the ability for users to charge the radios or batteries with the vehicle 12VDC. Peltor Heavy Duty Headset – A twin cupped heavy duty headset with a flexible boom mic. There is an an inline PTT unit built into this accessory. 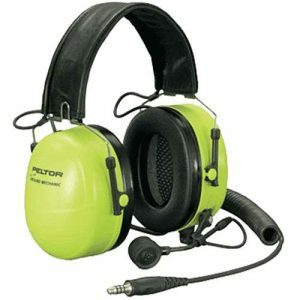 This item offers hearing protection and is the same unit that airports use. 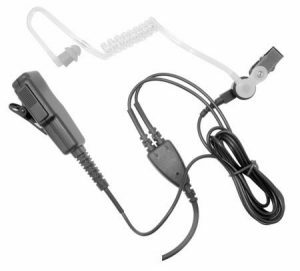 “In the ear” 2 wire earpiece/mic – non hygienic in the ear styled 2 wire audio accessory. Extremely covert. 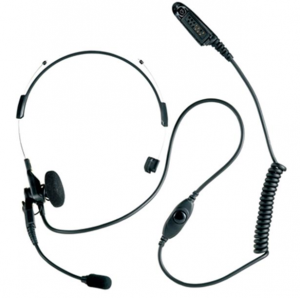 The accessory has a combined PTT and microphone, very light weight. ** The rubber tip and clear tube need to be purchased for hygiene reasons.